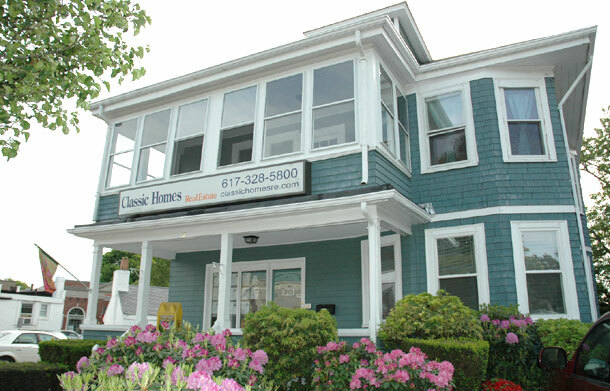 Classic Homes Real Estate, located at 12 Beach Street, Quincy, MA...Your Neighborhood Real Estate Expert for More than 24 Years! South Shore First Time Home Buyers: Stop Paying Rent Today! If For ANY Reason, You're Not 100% Satisfied with ANY Home you Buy Through US, We'll Re-Sell It for Free! South Shore Move Up Buyers: Buy One of Our Luxury Homes, We'll Buy Your Home for Cash! South Shore Real Estate Investors: Be the FIRST to Know About Soaking Hot Deals the Second They Hit the Market! Beat Out Other Investors! When You're Ready to Flip, We'll Sell it For You within 30 Days or We'll Pay You $3,000 Cash! Guaranteed in Writing! South Shore Sellers: Need to Sell Your Home Fast? We'll Help You Sell Your Home Fast, Even if You're Selling it Yourself! We'll Sell Your Home in 7 Days. Guaranteed in Writing! Classic Homes Real Estate is Here to Help with ALL of Your South Shore Real Estate Needs. We're Not Like Other Realtors. We Keep You in the Driver's Seat at All Times. If for ANY Reason You're Not 100% Satisfied with our Performance, Fire Us at Any Time, No Questions Asked! Guaranteed in Writing! Classic Homes Real Estate is located in the Wollaston section of Quincy at 12 Beach Street, at the corner of Hancock and Beach Streets (across from the Wollaston Post Office). Our free parking lot is located next to our building. MBTA Red Line To Wollaston T station. Walk across T parking lot east on Beale Street two blocks to Hancock Street. Continue straight across Hancock Street at lights, look for Bank of America ATM; our building at 12 Beach Street is directly behind the ATM across from the Wollaston Post office. From Downtown Boston From I-93 South, take Exit 12 Neponset. Continue straight off exit ramp following signs for Quincy. Go over the Neponset River Bridge, bearing right for Hancock Street. Continue straight for 1.7 miles to the traffic lights at the intersection of Hancock and Beach Streets. Turn left at the Bank of America ATM and then left into our parking lot across from the Wollaston Post Office You are at 12 Beach Street. From the South Shore From I-93 North, take Exit 8 Furnace Brook Parkway. Take the first right off exit the ramp. Follow Furnace Brook Parkway for 1.8 miles. Turn left onto Hancock Street. Continue 8/10 mile to the traffic lights at the intersection of Hancock and Beach Streets. Turn right at the Bank of America ATM and the left into our parking lot across from the Wollaston Post Office. You are at 12 Beach Street.